Hot Ink: Candy Corn Oreos: Halloween Trick? Or Treat? Candy Corn Oreos: Halloween Trick? Or Treat? It's a bit of an understatement to say that I have a sweet tooth. I love sugar. In any form. Baked goods? I eat them all. Candy? Yes, please! I once bought several tubes of colored frosting... not to paint a cake, but to consume straight from the tube. Yes. I am that woman. 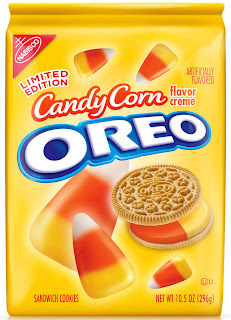 When I heard last week that Nabisco was releasing Candy Corn Oreos, I was intrigued. I love Oreos, even the golden ones. And I love candy corn, that delicious orange, white, and yellow confection that is generally only available in the fall. I know some people can't stand the stuff, but it's basically just sugar in chewy corn shape, so of course I dig it. But the thought of smooshing the two together didn't exactly sound appealing. Would the creme filling really taste like candy corn? Would the two together be too much sugar? Was such a thing even possible? Well, as I sit here, having only eaten 2 cookies in the last 20 minutes, I think I can say that yes, it is too much sugar. Even for me. The first thing I noticed was the smell that wafts out when you open the package. The frosting smells just like candy corn (which I guess means they smell just like delicious sugar!). As you bite into a cookie, the flavor of the candy floods your mouth in between the crunching of the cookie. But the flavors of the candy and the cookies don't exactly blend very well. This is no peanut-butter-and-chocolate situation, here. These two don't compliment one another. They kinda fight for dominance over your taste buds, with the frosting mostly winning. The overall effect, though, is an overpowering sweetness that coats your mouth and makes you wish for a tall glass of water to wash it all away. Oh my lord, I just ate a third cookie. I might barf. WHY DID I EAT THAT COOKIE? Oh yeah, so I could better describe the experience to you, dear reader. Do you see how I suffer for you?!? Yet, these cookies are too sweet for me. And there's a nasty, bitter aftertaste that lingers way too long. I feel the urge to eat something else just to get rid of the taste, but if I try to eat anything else right now, I seriously might vomit. So... I cannot recommend these cookies to fans of Oreos, candy corn, or sugar. I can recommend them, though, to masochists, especially those who enjoy being nauseous after eating only 2 little cookies. Ugh. To their credit, Nabisco did manage to capture the flavor of candy corn, but it is simply NOT meant to be consumed in creme-filled cookie form. Gah. The longer I sit here, feeling sick to my stomach, the more I'm starting to hate everything. These cookies are filled with candy corn and self-loathing. If you still desire to seek these out, they're being sold exclusively in Target stores for around $2.99 a pop. I give them a 1 out of 8 tentacles - yes, they got the flavor right, but I'm not sure they should have even tried! Now, if you'll excuse me, I need to curl up in a little ball and think about my life choices. I wonder if they had gone with the traditional chocolate wafer layers maybe it wouldn't have been quite so overpowering? Also, the black-and-orange theme would have been more Halloween appropriate. Then again, that might be even more disgusting. I am totally going to try to make my own.